Dark Calendar is a calendar application with a gothic twist. With Dark Calendar, you'll be able to summon a general meeting of the underworld in no time - just use the integrated SMS or email notifications to let everyone know about a scheduled event. 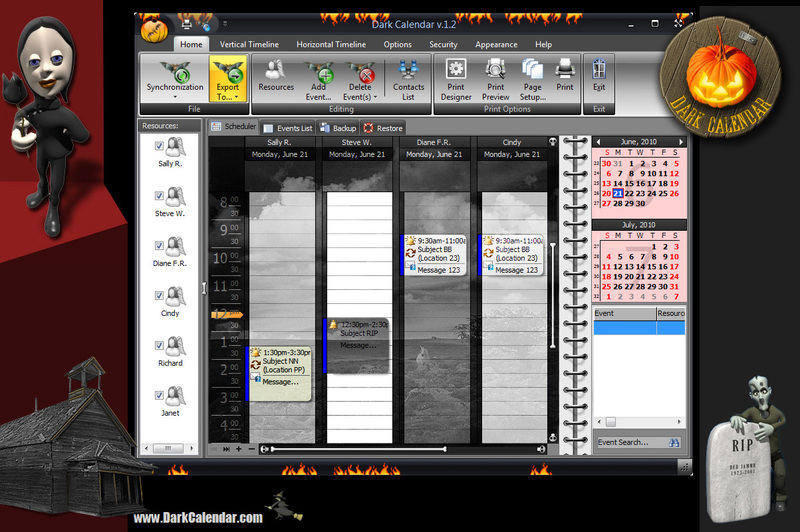 The calendar supports Day, Week, Month, Quarter, Year and other views and regional formatting options for more convenience. Try it in action right away and see that evil can be really good! Dark Calendar is a calendar application with a gothic twist. If you consider yourself a fan of the Gothic culture or just think the Dark is just as cool as the Light and that it would be fun to start using a program that is so much different from the rest of the software on your PC, it will definitely be the right choice. Dark Calendar uses the same control and interface elements most people are used to seeing in Microsoft Outlook, so the initial familiarization time is kept at a minimum. Dark Calendar is capable of importing tasks from Outlook and exporting them back, as well as saving the schedule in text, HTML, Excel and PDF formats. Qweas is providing links to Dark Calendar 1.9 as a courtesy, and makes no representations regarding Dark Calendar or any other applications or any information related thereto. Any questions, complaints or claims regarding this application Dark Calendar 1.9 must be directed to the appropriate software vendor. You may click the publisher link of Dark Calendar on the top of this page to get more details about the vendor.